I whipped up this savory dish for some dinner guests the other night. It's extremely tasty and on the spicy side for sure! I love spicy food, however, you can modify the amount of cajun seasoning to 1 tablespoon if you prefer it to be mild. 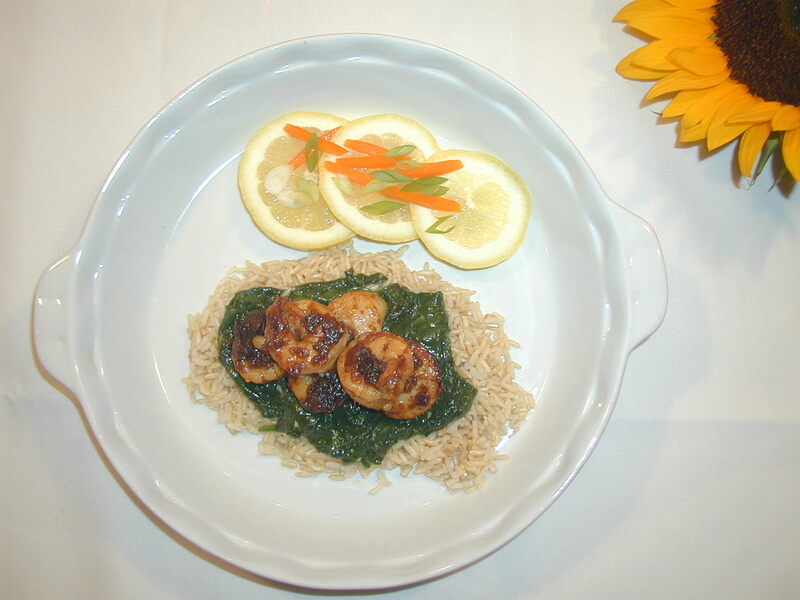 I decided to serve the shrimp and scallops with brown rice and sautéed baby spinach with shallots and garlic in and out (sauté the garlic a bit in olive out until it begins to turn a golden brown, then remove it completely from the oil). This fabulous meal can be assembled in a measly 30 minutes. Salt (To Taste) *Be careful because the Cajun seasoning already has salt in it. Start with 1/4 a teaspoon and take it from there. Peel and devein the shrimp removing the tails as well. Rinse off the shrimp and scallops in cold water in a strainer and put them off to the side. Let the water drain out of them as you are preparing the Cajun paste For the Cajun paste, combine in a mixing bowl the canola oil, Cajun seasoning, white pepper, black pepper, garlic powder, chili powder and salt. Whisk the contents into a paste thoroughly, mixing all of the ingredients together. Take the shrimp and sea scallops and toss them in the paste until all of it is completely coated in the mixture. Take a non-stick sauté pan. Add the butter to the pan while it’s completely cold them put the pan on medium heat (for a lighter heart healthy dish, simply spray the pan with non-stick spray and do not use any butter at all). When the butter melts, completely coating the pan and it begins to turn a somewhat golden color, add the shrimp and sea scallops. Turn up the heat slightly. Let them sit on the bottom of the pan on one side for about 3-5 minutes or until they begin to brown . Then flip them over and do the same for the other side. Continue until the shrimp and scallops are completely caramelized (the caramelizing effect will occur only if you use butter). This will take anywhere from 15-20 minutes. Remove them from the heat and serve them over rice (brown or white). Serve with your vegetable of choice.